In the good spirit of FAIRE we are excited that THOMAS IAN NICHOLAS will be in attendance for the FIRST TIME EVER AT A FAIRE! He will be in GARB for photos and you can even get his autograph! Thomas is best known as Kevin Meyers from all the American Pie films, Henry Rowengartner from Rookie of the Year, Walt Disney from Walt Before Mickey and (trumpets please) SIR CALVIN FULLER of RESEDA from A KID IN KING ARTHUR'S COURT with Daniel Craig and Kate Winslet. Thomas has recently produced the feature films entitled The Lost Tree and Living Among Us (distributed by Sony Pictures). Thomas will be on site promoting his next movie, Handbook for Mortals, a bestselling book written by Lani Sarem (actress/author) who also wrote the script for the upcoming film by the same title, Handbook for Mortals. 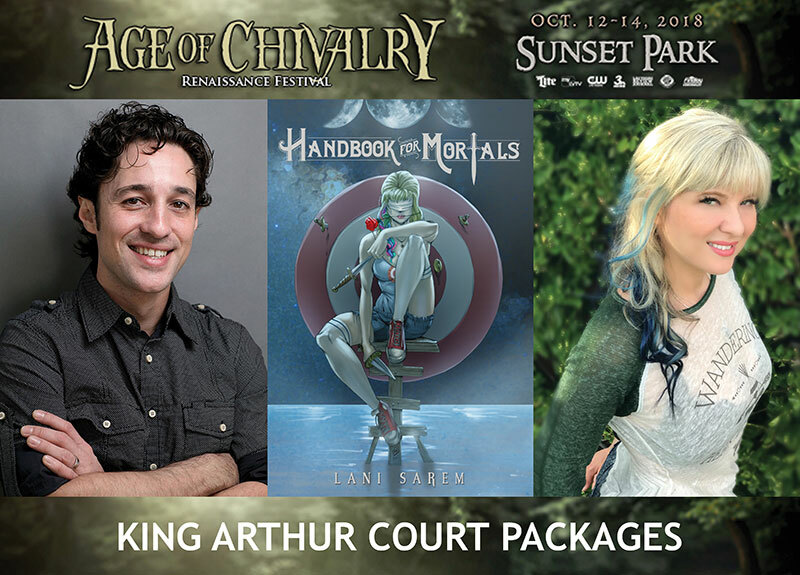 Thomas will be at FAIRE along with actress/author of Handbook for Mortals Lani Sarem. They will be attending all three days of FAIRE and special guests at each jousting tournament. Come make all your fantasy FAIRE dreams come true with a photo and/or autograph from Thomas or a book signed by Thomas and Lani. HANDBOOK FOR MORTALS was 34 on the USA TODAY bestseller list when it debuted and is now being made into a major motion picture. Nestled amongst the illusions of Las Vegas comes a story of a young southern woman who moves to Vegas to work for a big magic show but carries the secret that she can actually do real magick. A riveting original storyline set in current day with relatable characters, a love triangle of sorts and just enough magick and intrigue to ensnare you. HANDBOOK FOR MORTALS is the first of the series of five books and is a fun story that adults love but is appropriate for all ages to enjoy. · A SIGNED KING IN KING ARTHUR'S COURT DVD: $60 (we will also have a few VHS's as well). OTHER SIGNED OPTIONS AVAILABLE ON SITE. COME SEE THEM ALL THREE DAYS AT FAIRE!